Harkness Furniture YOUR CHOICE SALE! Our YOUR CHOICE SALE is happening now! 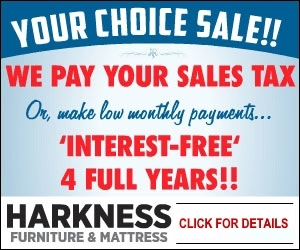 If you're shopping for furniture or a new mattress set, Harkness Furniture is giving you the choice of INTEREST FREE FINANCING for 4 FULL YEARS -or- WE'LL PAY YOUR SALES TAX! * Ready to give your home a spring make-over? Be sure to come by for special savings on sofas, sectionals, recliners, bedroom furniture, dining rooms sets - even outdoor furniture is included in the Harkness Furniture YOUR CHOICE Sale! Click the link below to see our current ad for complete details. Hurry in, sale ends soon!